From breastfeeding babies while balancing in tree pose to using sofa cushions as bolsters, a home practice is real and unfiltered. What’s not to love? 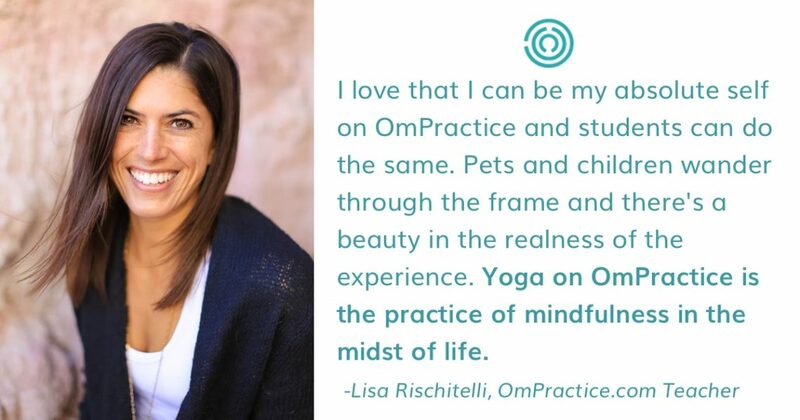 Lisa Rischitelli, a 500-hour trained yoga teacher, is all about keeping things real. You’re just as likely to find her practicing asana at home as you are to spot her eating chips and salsa at a local Mexican restaurant. What’s special about Lisa? What you see is what you get with Lisa. Yoga and a home practice are tools to make every part of life better. It’s that same refreshing attitude that keeps her students coming back to practice with her though the online platform OmPractice. Not only has this petite powerhouse trained with esteemed yoga teachers, including vinyasa experts Kathryn Budig, Vinnie Marino and Bryan Kest; she’s completed thousands of teaching hours, led international yoga retreats, and currently serves as Teaching Director at Hot Asana Yoga in Colorado Springs. We recently caught up with Rischitelli to talk about what it’s really like to teach dynamic vinyasa flow classes from her living room, where she’s found carving out time for self-care even on your most hectic days is the best thing you can do for yourself and your yoga practice. You started teaching on OmPractice in 2017. It’s a new model with two-way video. What appealed to you about this start up’s live streaming yoga classes? I’ve moved a lot over the past ten years. Now, I travel to teach, co-lead trainings and co-lead retreats. My network of students is spread around the country and even the world. So, for years, I’ve been interested in expanding my online presence. But I personally didn’t have the skill set or desire to deal with the technology side. OmPractice was the perfect fit for me. It’s easy to use with a real-time connection [to students on their mats], interactive and affordable because teachers set the class pricing themselves. What do you think makes OmPractice special? The ability to see the students as they practice is huge. Seeing how students respond to a cue, if they need more or less, what settles for them, if we can move faster or if we need to slow down, it all creates a significantly safer and more fulfilling experience for everyone involved. Interactions before and after class have been really fun and so much more real than a pre-recorded, semi-scripted intro. What one thing do you enjoy most about teaching in a virtual environment? I love that I can be my absolute self on OmPractice and students can do the same. Houses are sometimes messy, and pets and children wander through the room. Students are substituting couch cushions as bolsters and there’s this beauty in the realness of the experience. Yoga in a studio setting is a lovely way to step away from your life when necessary. Yoga on OmPractice is the practice of mindfulness right in the midst of life. What is it like to teach in your living room through a screen? I tend to light a candle, make sure my space is clean for my own clarity, and set up my laptop and a glass of water. Most of the time, I’m sitting right in front of the computer using mostly words to guide students through class. Occasionally, if I need to demo something, I’ll ask students to look at their screens. Then I’ll step back away from the computer and return to my seat afterwards. How do you replicate the vibe of a “real” yoga class online? What I’ve found is that when you’re asking students to be mindful and, when I’m being mindful, yoga works. It doesn’t matter if you’re in the same room together or 500 miles away. It’s not just my choice of poses that makes people feel different from the beginning to the end of a practice. It’s their willingness to put effort toward being present for a certain period of time. OmPractice makes it possible for me to help facilitate that. What do you think separates a good teacher from a great teacher? Above and beyond all else, I think a great yoga teacher knows that he or she is no different from you, the neighbor down the street or someone on the other side of the world. If we approach everything – including this physical practice of yoga – from an underlying foundation of compassion and inclusiveness, it influences how we see ourselves and those around us. Then, on top of that, a great yoga teacher is willing to keep learning about the philosophy and science of yoga. I think any yoga is better than no yoga. But, also, know what you believe in as a teacher and stop discounting other schools of thought as wrong. How do you constantly strive to be the best teacher you can be? Practice make a big difference and so does continuing to train. I’ve always been comfortable with the physical asana practice but meditation continues to be a useful-yet-elusive practice for me so I keep working on it . Teaching teachers has also taught me so much. [My practice] gets more refined every single time I’m co-leading a training. How is leading yoga classes on OmPractice different from teaching in a studio? Using primarily words to instruct is a real skill. It’s imperative that teachers are capable of doing that for this format. You can’t demo every single pose and, as a teacher, the ability to respond to what’s happening in the moment. Adjusted cues or sequencing comes from experience and practice. I was a new teacher once and I work with new teachers all of the time. But this format just doesn’t suit teachers who are still figuring out languaging. What does your class offer that students may not get from anyone else? I love combining functional alignment with dynamic, powerful movement. I believe students can take ownership of their practice, but it’s my job to give them more information on how to do that from pose to pose. I often say whether or not you can do a posture doesn’t matter. It’s the intention, the playfulness, the curiosity that comes with the approach matters a lot. I call my style alignment-based power vinyasa, but lineage-wise, I’m a mutt. I’ve picked up information from many styles of yoga and even physical therapy. To learn more about OmPractice sign up for our newsletter. We only email you when it’s important. But this way, we can help you #BeAtHomeInClass.